SH Body Works, a comprehensive accident repair centre located in Basildon, Essex. As a company with more than two and a half decades of damage and vehicle crash repairs, we know how to go about correcting the damage on all makes and models of vehicle. We specialise in Accident repairs, Crash damage & Vehicle repair. A total of 3 reviews for Shbodyworks.co.uk have been written yet. The most recent reviews are listed below. I found this company a breath of fresh air they was friendly, reliable,as good as their word.They did a great job on our car at a fair price can't praise them enough would recommend to any one.Tank you so much for a great service. Top repair company, helpful, friendly and stick to their word, I am glad I found them. Thank you so much for repairing my car in a swift professional manor. 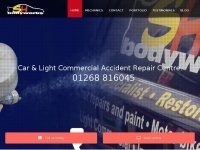 Great repair centre, I have used SH Bodyworks a few times now and have never been let down, I can not fault the quality of the work carried out. I would highly recommend this company to anyone looking for a reliable, friendly and fairly priced to take their car for repair after an accident. Baldwinsgroup.co.uk - Baldwins Re­pair Group Ay­les­bury, Lei­cester, Lon­don, ..